Trails left by NASA’s fleet of rovers, with the assistance of the Martian winds and dust devils that scour the rust-colored plains of the Red Planet, usually fade with time. When the Mars Science Laboratory rover Curiosity touched down on the surface of Mars, it did so via the innovative “Sky Crane” system – a jetpack that left its own, unique signature on the flash-frozen world. NASA has reviewed Curiosity’s blast zone, created during the August 2012 landing has faded with time, albeit irregularly. Using the High Resolution Imaging Science Experiment (HiRISE ) camera on NASA’s Mars Reconnaissance Orbiter (MRO), NASA scientists have noted how the marks left by the one-ton rover’s landing have changed with time. NASA reviewed the status of the blast marks over the past two years (approximately) and discovered to their surprise that the pace of fading has slowed and might even be in the process of darkening again. 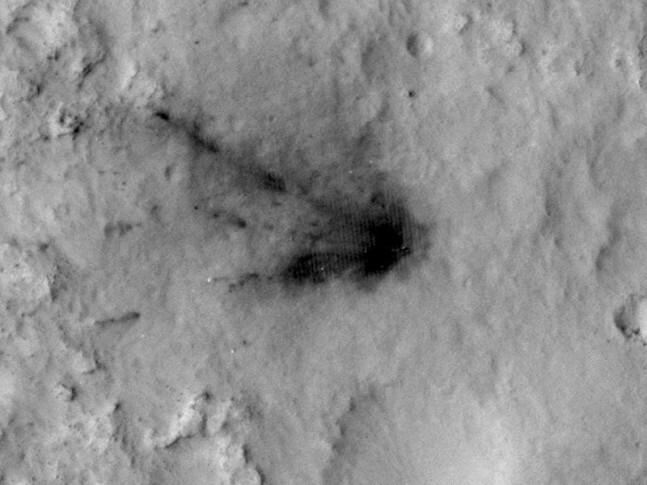 The HiRISE imagery tracked the blast zones in four locations, which include the landing site of the Curiosity’s heat shield, decent stage, retro rocket blast mark, and the Sky Crane’s crash site. Taken in four series, the images were captured at different intervals in the intervening months since landing, ranging from five to seven different times. Scientists used this review to determine how long it would take the thin Martian atmosphere to erase the scars left behind from Curiosity’s arrival. 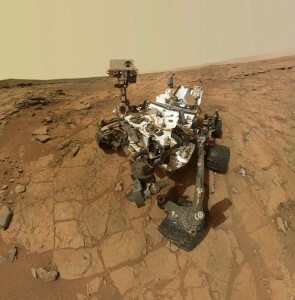 Curiosity’s primary mission is to determine if Mars was ever capable of supporting microbial life. Given an initial life span of one year, the Mini Cooper-sized robotic exo-biologist has long since surpassed its warranty. At present, NASA plans to return to Mars in 2016, when the space agency will launch the InSight (Interior Exploration using Seismic Investigations, Geodesy and Heat Transport) lander to the Red Planet. Four years later, NASA is planning to follow up the highly-successful MSL Curiosity mission with another rover based on s design (and possibly using spare parts left over from MSL ). InSight will serve to gain a better understanding of the processes that formed the “terrestrial” planets; these include: Mercury, Venus, Mars, and our home world – Earth. InSight has been outfitted with a heat probe which will allow the fixed spacecraft (like the Mars Phoenix lander on which it is based, InSIght will not be capable of moving once it has landed) to penetrate the ground and to monitor heat emanating from the Martian interior. MRO has been on orbit above the flash-frozen terrain far below since 2006. It has used HiRISE and five other scientific instruments that the spacecraft has been equipped with to study the vast plains, steep canyons, mountain ranges, and volcanoes that pass under MRO’s lofty vantage point. At present, NASA has two rovers and three orbiters studying Mars and the space agency has plans to send crews to Mars sometime in the 2030s. The robotic pathfinders are operated in order to gain a better understanding of the processes at work on Mars long before astronauts place boot prints into the fine Martian dust. Some of the elements NASA is studying include: past environment, climate cycles, geology, and biological potential.